CLASS stands for Confidence-based Learning Accuracy Support System. Watch the video below to see what CLASS is all about. CLASS asks you to make judgements of your confidence in your responses and to generate detailed and instant feedback regarding your abilities. Before and after CLASS quizzes, you are asked to predict your performance; first based on just the quiz learning objectives, and then after having taken the quiz. How accurate are your perceptions? Quizzes in CLASS are generated by instructors and tied to specific learning objectives, allowing you to accurately assess your progress. CLASS provides you and your instructor with information regarding any gaps between your perceptions and your abilities - practice and become more accurate! For students, CLASS is a quizzing website that uses your confidence in your answers to communicate important information regarding your learning behaviors which help you guide your studying. Results from CLASS quizzes allow you to gauge your performance in a course or topic. Results by learning objective allow for focused feedback regarding your abilities. Feedback regarding the accuracy of your perceptions can help you better monitor your learning. Coming to CLASS this summer, students will be able to dynamically generate a quiz based on selected learning objectives or other metrics, such as most frequently missed questions. 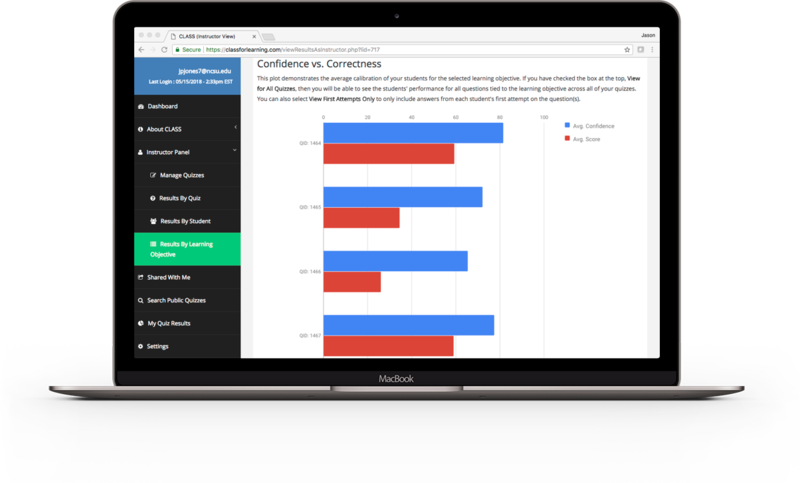 For instructors, CLASS can provide novel information regarding your students learning from confidence measures taken during quizzes. High disparities between students' confidence and performance can highlight problematic topic areas. Real-time student data provides opportunities for targeted instructional interventions. Visualizations allow for identification and characterization of student learning processes - are they over/under-confident? Providing students more than just performance feedback can provide a valuable instrument for change through more focused studying. We have been using CLASS in college-level introductory geology courses for the past 2 years. We reached out to students for feedback and here is some of what they have said about how CLASS helped them in the course. We love helping students learn better, but we also want to hear how you think we can improve the CLASS experience. Stay up to date with our latest features or suggest your own ideas by taking our short survey. 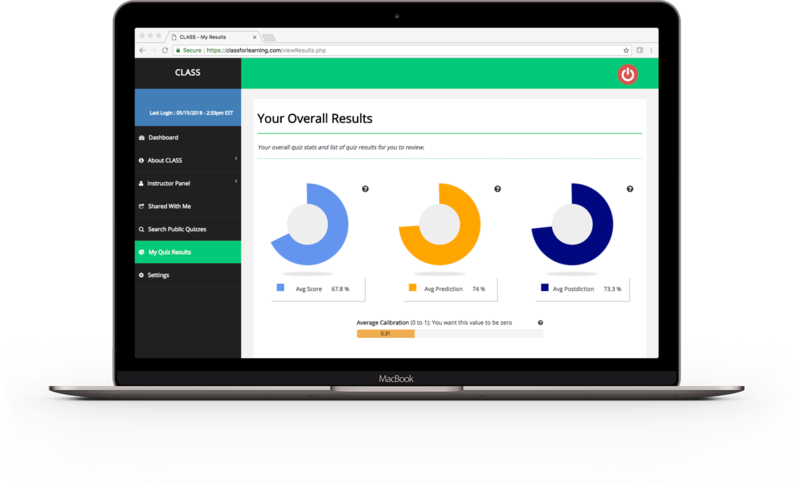 CLASS is an account-based quizzing website that collects and operationalizes student confidence data to improve performance and the accuracy of student perceptions.